I’m lucky to be around cats like BASS CHEF aka TIBET & Josh Jetson. Also Radiobomb & Dank Radio crew @ 90.7FM in LA. Working with good people is a key in any activity! I keeps it real son, Disco Duck. Hey that was the jam as a kid, prolly drove my parents nuts singing that over & over!! I didn’t really get heavy into music until my teenage years. I started to hear hip-hop in the late 80s. I became a fan in early 90s. Remember when hip-hop used to be fun? Digital Underground, Public Enemy, Ice Cube. I was more into indie rock and new wave back then. The first music that really made a lasting impression on me was hearing jungle/dnb in downtown LA, it was 1997. N20 jungle label had a loft / store there called Freeburning. I was an intern at Giant Robot Magazine that shared the loft. I was exposed to my first real underground scene at that time. Like a lot of things 90s was a golden era for art & music, I was lucky to catch the end of that era. First time I saw real DJin going down, there was a skate ramp in the back, lot of classic underground parties. I had been to some indie rock / punk shows, but the LA rave scene was the sound & movement that made a lasting impression on me. I put a summer day party together called A-SIDE @ The Airliner in LA, same spot where Low End Theory goes down every week. It was a day party, we had bboys, jungliest, Japan Reggae Crew, South Rakkas Crew (Mad Decent) headlined. Awesome vibes on some ’90s ish, peep the vids, it was goin off. We working on the next episode, stay tuned!! Respect Drum n Bass night in LA running 13 years strong, I been there more this year than in the last 5 years. Lot of quality DnB in 2012, and they’ve had back to back classic shows regularly the last year or so. That’s a hard one. I’d have to say Mac n Cheese, cuz most times you gettin instant ramen at home and that ain’t OG. I’m serious about my noodles son. Our lives are so fast paced now, I’m gettin most of my info from internet talk radio these days. Check Gary Null for health & world issues. There’s some good channels on youtube also. Books that I can recommend? Anything by OSHO, they’re thought provoking and not too long. Good self help books. If you want to help people do it locally or to organizations where you know help is getting to the right places. Lot of people these days are looking to help Africa, Haiti etc, and that’s needed, but we have a lot of people in our own communities that need help too. Try to do something positive in your community every week, a little bit goes a long way, even if its a smile or thumbs up. Where we as a human race are going. Look around, something needs to change – big time. The time we’re living in has been talked about for thousands of years. Time to do what’s right people. Provoked from the Indio/Coachella Valley and AJ Jackson. S.P.Y. – Killin it on the DnB tip, hard & liquid tracks. the guy is total science for 2012. My Brazil homies LEVEL 2, DJ CHAP, Crytical Dub & Andrezz, they’re gettin big support from V Recordings / Liquid V / Chronic. Also keep an eye out for D-RAKKAS & RYOKO, new electro group comin out. If you like South Rakkas Crew you’ll dig their sound. Keepin the mix tight & rockin the crowd. DJs are entertainers, whatever you do, keep the crowd movin & grooving. I practice a lot before shows, I think as a performer you have a responsibility to put on a good show. Art is as important as food. How you dress yourself (fashion), how you walk, talk this is all culture, art. Old Confucian principle is if you can’t write a poem or perform some sort of music, you’re a barbarian. Art elevates the soul, whatever you do try to bring something artistic into your life everyday. OG SLICK DISSIZIT! 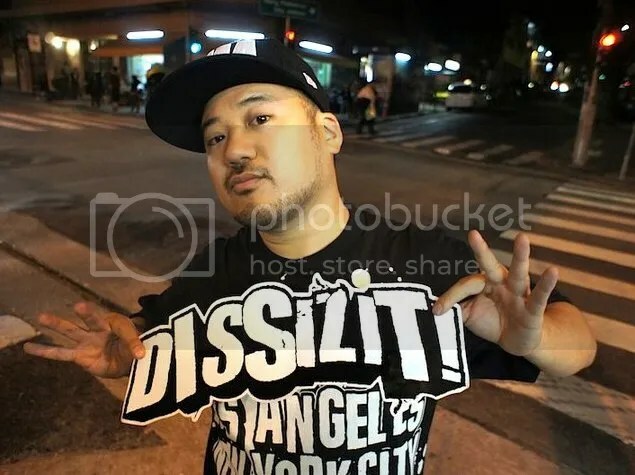 Been reppin Slick’s stuff since the Shaolin Worldwide days, late ’90s => DISSIZIT.COM! DrudgeReport.com is good for headlines. Rense.com & Redicecreations.com if you’re on the fringe tip. Just be aware everything has some sort of agenda. Be discerning and don’t believe everything you hear. 22.) where do you see the future of EDM heading? We’re at the end of an era, something new will happen across the board. Hard to say. Artists are crazy people. That’s what makes them unique. A lot of times, I don’t want to know too much and just admire their art from afar as a fan. Brazil is a great place for DnB & clubbing in general, they don’t get the headliners as often as we do in LA, but the vibes are incredible. And yes the rumors are true, Brazilians girls are super hot. I used to like the Lakers, but Showtime Lakers, Kareem, Magic Johnson. Was there a golden era for sports too? I’m haven’t been so into sports the last few years. West Coast Jungle Legend R.A.W. aka 6BLOCC. Hip-hop mixing skills with electronic music. The guy laid down the blueprint what else can you say! I played Tranquera the Dubstep/Bass party in Brazil three times, really incredible experience. Also I’ve thrown two parties in LA the last few years. I’d rather play a party where I can play obscure stuff or open format than have to stick to a top 40 format. I came up in underground scenes, so I always had a open mind for niche / underground music. As a DJ its a balance, to keep the crowd moving but to keep yourself musically happy too. I’m lucky to have been able to do that over the years. Posted on September 4, 2012, in INTERVIEWS. Bookmark the permalink. Leave a comment.